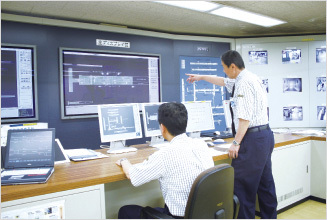 The transport division responsible for stations and train operations and the technical division responsible for rolling stock, maintenance and electricity have established a comprehensive transport management structure, with the Integrated Control Center at its core. 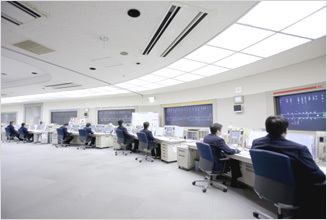 At the Integrated Control Center, by sharing the various data and weather information necessary for transportation management among the controllers for traffic, electric power, rolling stock, and facilities and equipment, real-time information gathering and accurate determination of conditions is made possible. Also, the Cab Signal Automatic Train Control (CS-ATC) system has been installed on all lines, improving operation efficiency along with safety. In addition to the operation management system, we are proceeding with initiatives to increase safety in all stations. We have introduced platform doors to prevent passengers falling onto the tracks or making contact with moving trains, installed emergency stop buttons that stop the train when there is an emergency and installed security cameras to increase the safety of daily transportation and prevent crime inside stations. Furthermore, we carry out emergency drills on a regular basis to enable station employees to deal with unexpected events calmly, quickly and appropriately. We have installed a wide range of disaster prevention equipment in the stations in preparation for the unlikely event of a fire or earthquake, etc. Furthermore, all equipment is managed with the Disaster Prevention Monitoring System in the station offices, enabling us to monitor all areas within the station in an integrated manner. Even if a disaster should occur, the measures we have in place will enable us to promptly and appropriately extinguish any fires and evacuate the passengers.